A week ago a woman who my husband went to high school with rolled over in her vehicle on a frontage road and died. She was 34 years old and left behind her husband, and high school sweetheart, and two young daughters. My husband is friends with her husband and has worked with him in the construction world on and off through the years. Upon hearing this tragic news I was reminded once again about the fragility of life and how we really never know what is going to happen from one day to the next. I was also reminded about the importance of gratitude and the expression of love and kindness towards one another. It is easy to forget that this day, today, truly is a gift. It is easy to forget just how incredibly much we have to be grateful for each and every moment. Over the weekend I was reading the news online and came across a story about a shooting that happened in Florida. A man took the lives of 6 people and then was shot and killed by police. Among the victims was a 17-year old girl. In another story the body of a young woman was found after a boat crash the night before left two people missing just outside of New York City. The story went on to mention how the young woman was about to get married and a quote that ended the article said: “She was one of my students and a bright, sweet girl loved by everyone,” she said. “I knew that she was getting married, and to Brian (her soon to be husband and an injured party in the same boat accident). To happen to two such special kids — it just shouldn’t happen.” And in Indiana three people were killed and 26 were sent to the hospital when a bus, minutes from returning home from a church camp in Michigan, rolled over after exiting from the interstate. These situations all happened around the U.S on Saturday. Tragedy happens everywhere everyday. Recently on my post entitled Half Full I spoke about self-acceptance and how our local dharma teacher offered his experience of how the best way he knew to practice self-acceptance was to practice acceptance of others. When we’re practicing one, we’re practicing the other at the same time. Self-acceptance and acceptance of others cannot be separated – they are interrelated. As I’ve been thinking more about this teaching some thoughts have arisen. Tolerance is not the same thing as acceptance. I remember when I used to consider myself an accepting person when really what I did was tolerate people on the outside and judge them on the inside. For me this took shape in the form of irritation as well. I was constantly irritated by others, sometimes at really slight things. What I’m realizing now is that I had genuine acceptance at times for some folks but most of the time my acceptance hinged on whether they were acting in a way that I approved of or made sense to me. I had acceptance for others when things were easy and I didn’t have acceptance for others when things were hard. And so it went: Acceptance of a friend who’s struggling, sure! Acceptance of a driver who just cut me off, nope! Acceptance of my husband who’s just washed the dishes, sure! Acceptance of my husband who’s left all of his dirty clothes under the bed for the thousandth time, nope! Acceptance of someone who I have loads in common with, sure! Acceptance of someone who I have very little in common with, nope! This type of system of separation is very common, albeit subconsciously. Sure it’s easy to accept what we agree with but how well do we accept what we don’t agree with? I’ve often heard that a very good indicator of the strength of our practice can be seen through our interactions with our family. 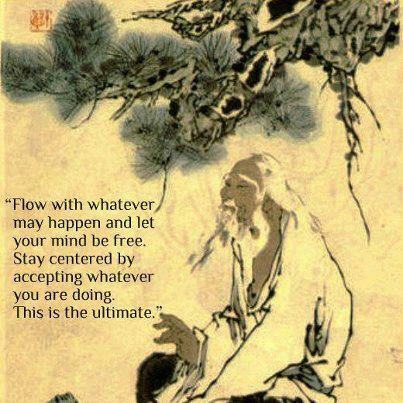 If we consider ourselves to be generally accepting let us go and spend some time with our family and see what happens! I don’t know about you (although I suspect most of us share this) but up until only very recently whenever I spent time with my family I became internally pretty unglued fairly quickly. I was consumed in judgement, irritation, and stress. Thank goodness for impermanence, eh? Things change! And with the intention of self-understanding and diligent practice transformation is not just a possibility, it’s inevitable. It’s important to keep in mind that acceptance is not a destination to be reached. If we think we’ve gotten to the point where we have any teaching down and think there’s no work left we’ve missed something along the way. Acceptance, like life, is a practice, an ongoing, unfolding journey. Is This Serving Me Well? Over time this question will begin to turn on the light of our inner workings and transform that which is done by unconscious reaction to one of conscious response. Reactions are automatic, learned habits and tendencies whereas responses entail connection, engagement, and awareness. Generally speaking the human condition (at least in the west) involves operating much of the time in the dark – on auto pilot. We spend a lot of time wrapped up in the past or the future. 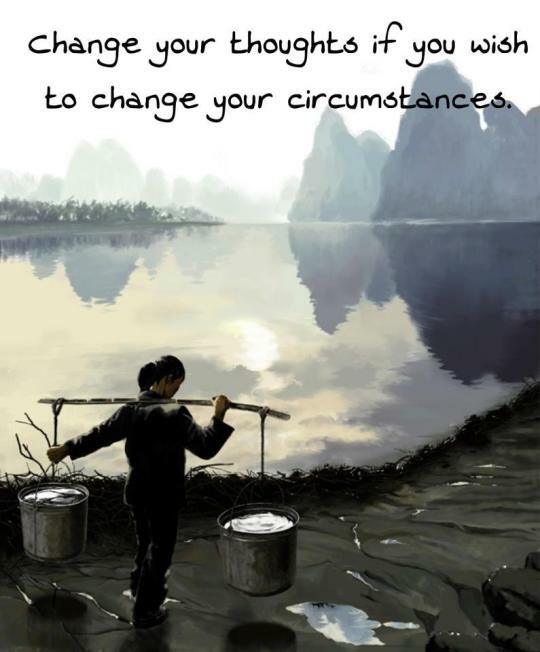 We spend a lot of time complaining, worrying, being stressed out, and looking at the world through a lens of negativity. To start asking ourselves, “Is this serving me well?” is to move in the direction of changing these unskillful patterns towards the light of understanding and transformation. When we simply ask ourselves this question we are already growing and strengthening our practice of mindfulness regardless of whether we know how to put into action a different response or not. We get the life we create. Am I happy right here in this moment? If the answer is no, why not? 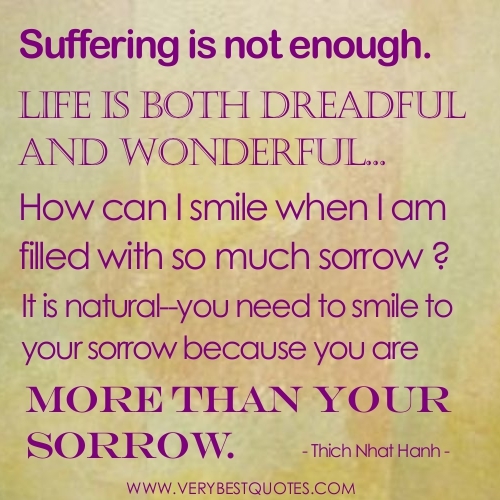 What am I doing to contribute (positively or negatively) to my situation in the here and now? Is what I am doing serving me well? 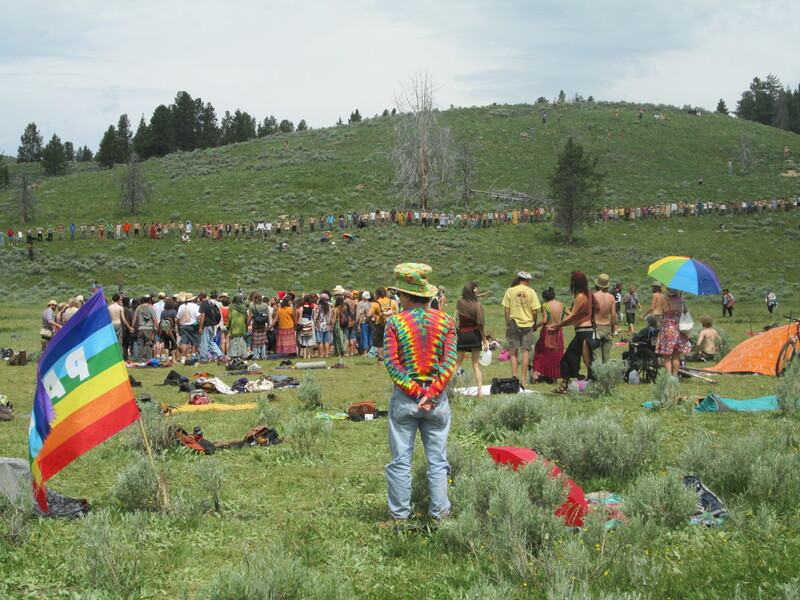 This is part 4 of 4 – to start from the beginning please go to Rainbow Gathering, Day 1. 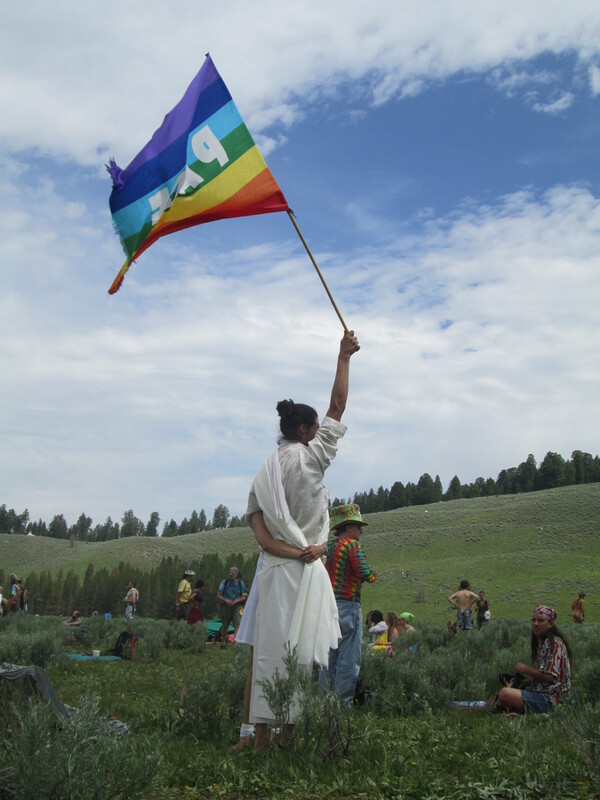 My husband, step-son, and I just returned home from the rainbow gathering in the Big Hole Valley area of south western Montana. I wrote most everyday while we were gone and thought I’d share our adventure. 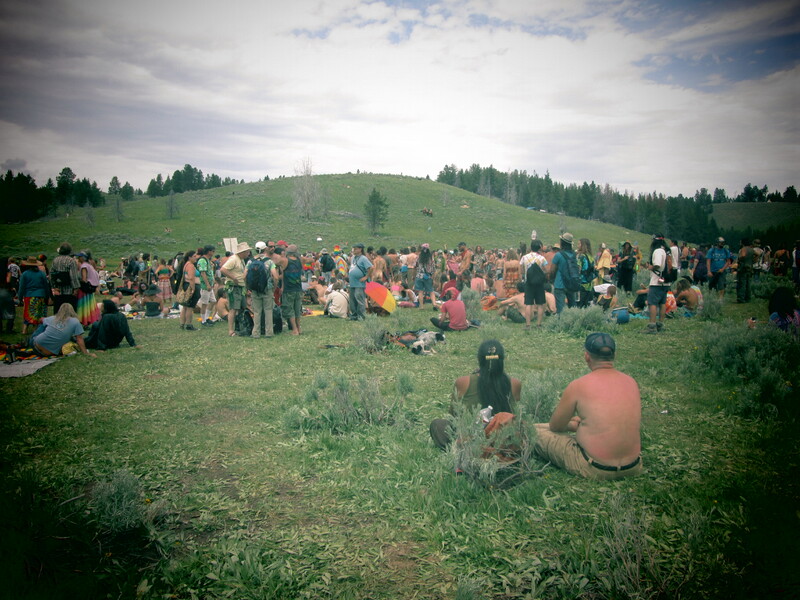 Yesterday was the big peace circle in the main meadow (the apex of the gathering). 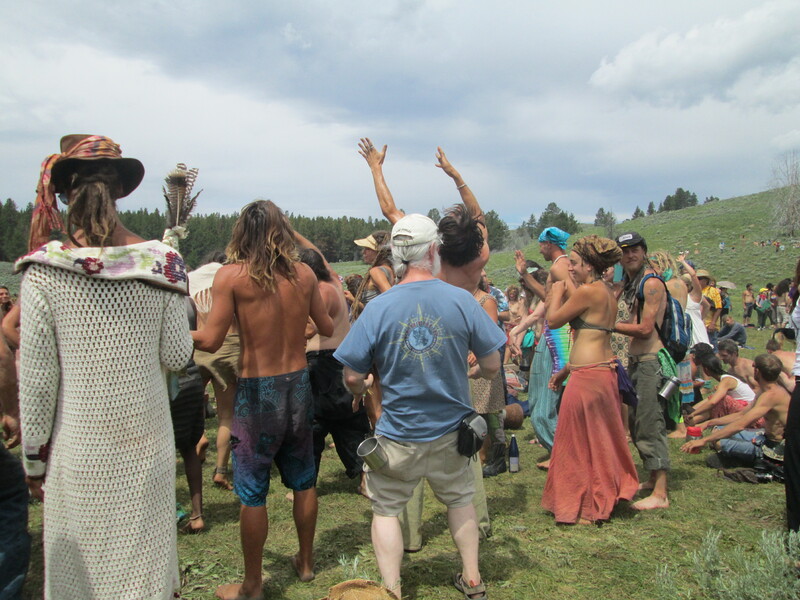 After a morning of silence (which most people engaged in) we gathered holding hands, a huge circle up into the hills and trees with a few concentric circles in the middle where the om circle was. The silence was broken by the kids parade around noon with cheering, shouting, and celebrating which then gave way to drumming, dancing, merriment, and laughter. It was quite powerful to see thousands of brothers and sisters holding hands, smiling, holding silence, gathering for peace and unity. 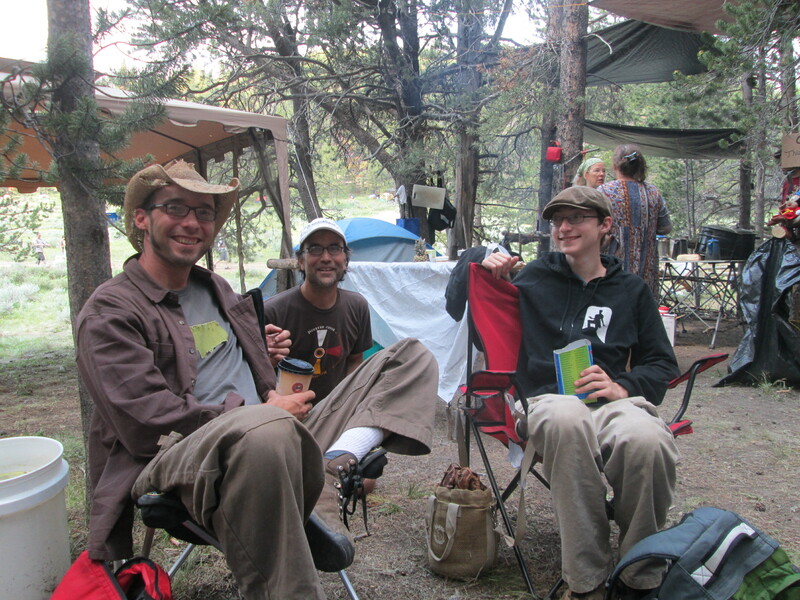 The gathering, like life, is what you make of it and we all had a great time exploring, camping, making friends, spending time in the woods, being with our greater family, and enjoying the rich diversity and warm community atmosphere that is woven into every thread of the gathering. 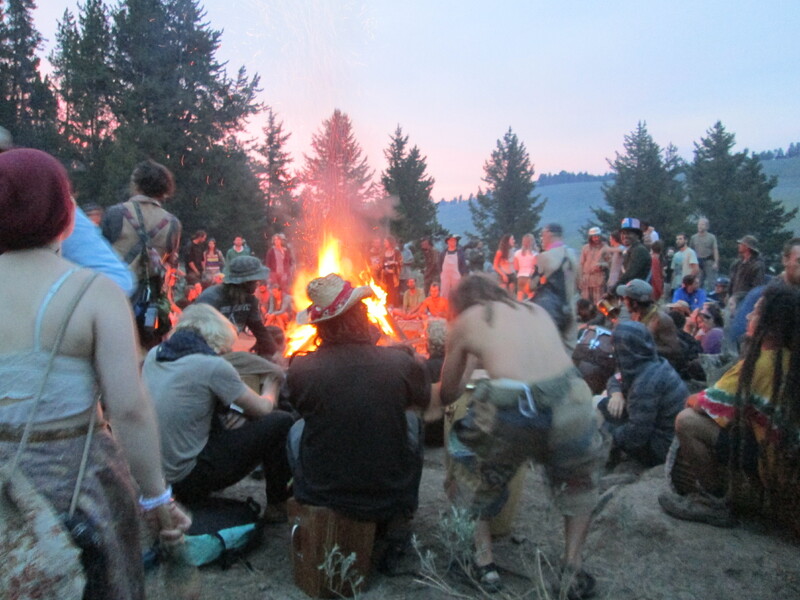 This is part 3 of 4 – to start from the beginning please go to Rainbow Gathering, Day 1. Today an afternoon thunder and quick passing rain swept through camp sending many folks to take cover in their dwellings. In trade circle I exchanged some new organic socks for three AAA batteries and then a pack of Montana artisan greeting cards for three more to outfit both my own and Mike’s headlamps which were growing dim. I lent a hand for a couple of hours in the kitchen at Kid Village scrubbing pots and pans and refilling water at the dish stations, hand washing, and drinking water containers. As a hard worker I won the attention of an old rainbow there who thanked me for my service and said that more folks should be like me and then jokingly told me he would follow me home :) I enjoyed the work and was dirty, wet, and well gratified when all the heavy pots and serving platters were clean and awaiting the next meal. 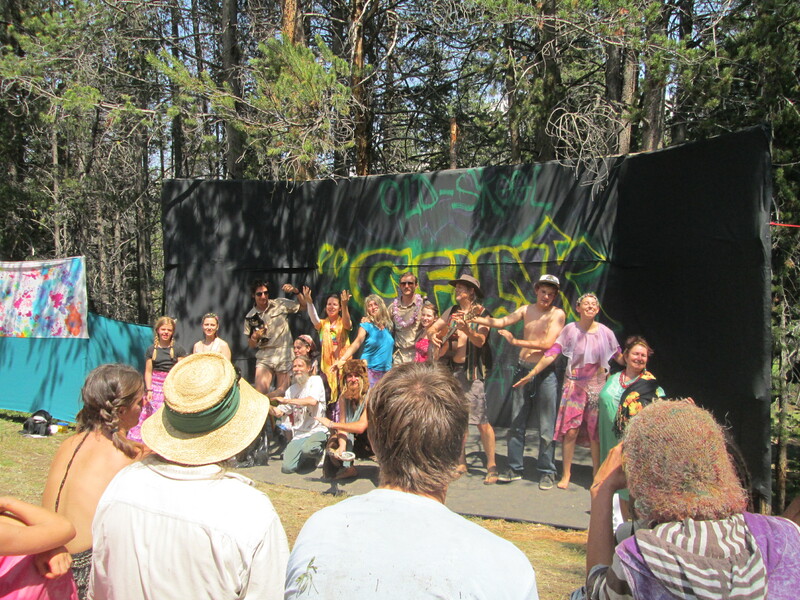 We went to see Rainbow the Musical at the Granola Funk stage which very comically depicted a teenage boy’s first gathering with his mom. There was a whole cast of characters including a guy in a bear suit and two guys dressed as 6 Up (the rainbow term for police) with short shorts and big sunglasses. It was a funny play and well attended. Searching for dinner we found a kitchen serving a hot pot of rice and curry and then met two guys along the trail handing out large, rough chunks of milk chocolate out of huge ziplock bags. Food is given freely here and it’s really quite an amazing experience to simply be able to walk around and be fed well with love. It is a great gift to have full bellies. 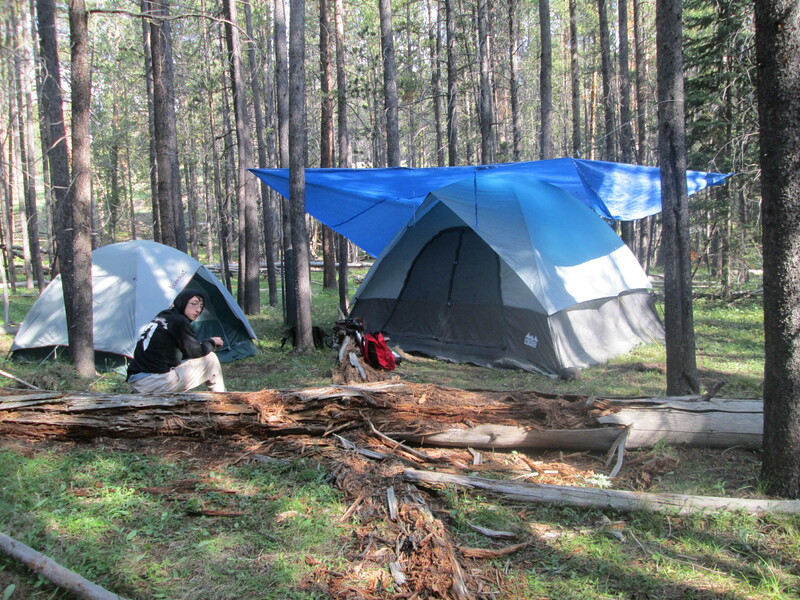 Last night we stayed out late at Granola Funk and got back to camp around 1:30 in the morning. On our way to G. Funk we stopped by the boogie pit where a huge drum circle takes place every night through dawn. Then we headed over to the stage at G. Funk to watch the Rainbow Dating Game which was followed by singer/songwriter performances that Mike signed up to be a part of. Dark 30 was the slated start time of the Dating Game and as very few folks know what time it really is things in rainbow land simply start when they start. The Dating Game consisted of rounds (more rounds than the audience had patience or want for) where one person was blindfolded and then had three mates to ask questions to and then choose from to go out on a rainbow date with. Most of the rounds had a gal choosing from three guys but there was one round with a guy choosing from three gals and one round with a girl choosing from three girls – they tried for an all male version but didn’t have enough participants to pull it off. The stage was lit by a couple of nice solar powered spotlights along with a strand of lights on either side of the stage. As the night wore on the lights faded more and more until finally just headlamps and flashlights were used. We laughed a lot during the game as bachelors sang love songs and answered the re-occurring question about what they would do if their lady love was abducted by aliens in their attempts at wooing the hearts of the blindfolded bachelorettes. Today was my birthday (the big 34!) and inspired by a guy 2 days ago who wore a sign announcing that it was his birthday I too fashioned a sign saying, “Today is my birthday,” and strung it around my neck. I was hesitant at first to wear it thinking others would see it as an egotistical act of attention seeking but something in me was called to wear it with a deep sense of authenticity and joy and so I did. It turned out to be the best thing I could’ve done to celebrate my birthday! I received hundreds of Happy Birthday wishes, dozens of hugs, candy from 5 or 6 different people, a tangerine, a beaded necklace, and even beautiful stones. And because of the sign I wound up meeting two great new friends: Gray, a lovely woman in her 50’s and unfortunately a fellow foot pain sister and Meredith, a woman I would guess was in her late 30’s, from Louisiana here for her first gathering on her first day with her 14-year old son. Some more highlights from today: I held a sweet little kitten exploring the woods on a leash, wove wildflowers through my bamboo hat, met two other sisters who shared my birthday, handed out mini bagels with peanut butter on the trail, and attended the Gong Show at the G Funk stage who’s MC apparently once ran for presidency. We ate dinner at main circle with a couple of our new friends and then headed off to G Funk at dark 30 for the show which consisted of songs, beat boxing, comedy, twirling light up dance movement set to a Sublime song played on guitar, and a myriad of other talents great and small. There was another sprinkle of rain this afternoon with big fat drops dripping from the clouds for a minute or two and loud thunder which passed quickly just as it had done yesterday. And now the dark midnight sky is alive and bright with stars and the haze of the Milky Way of which I have not seen for far too long. 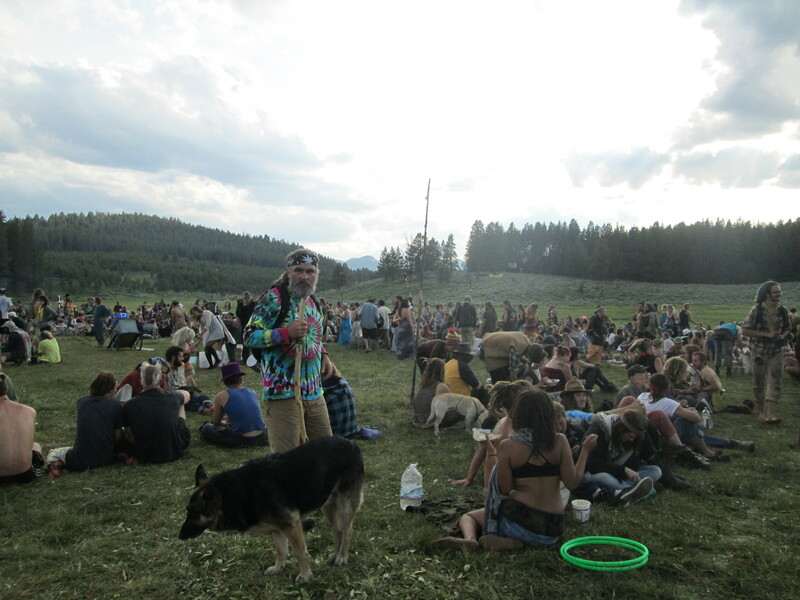 I also did some meditation (which I’ve been doing once or twice a day on my community meditation mat set up outside the tent off the main trail – and sometimes other folks join me and sometimes it’s just me), drank some chai, greeted folks on the road just pulling in, and pet the soft snout of a 6 Up’s (policeman’s) horse. And while walking the trail past 7 or 8 of the 6 Up Giddy-up (policeman on horses) they all wished me a happy birthday thanks to my informative sign. It seems I am in a very small, if not solo, minority of folks that don’t mind the presence of the 6 Up here at the gathering. Many are bothered by them and some folks are quite juvenile and rude to them when they pass by. The way I figure it, the 6 Up only become a nuisance when you’re doing something illegal, which many folks here are (aka smoking weed). The pervasive presence of drugs here (mainly weed but I’m sure there are other things as well) is unfortunate and I often wonder what this gathering would be like if they were not allowed or simply discouraged. In my view there is only so much we can accomplish, only so much change we can affect, when our mind is enshrouded in a fog. If we cannot cultivate peace within ourselves when we’re clean and sober, when our mind is awake and clear, we cannot generate lasting peace anywhere else in the world. While we are a beautiful family coming together in community and caring I see too that many of those among us are quite lost, still searching for that inner peace, that true place inside to call home. 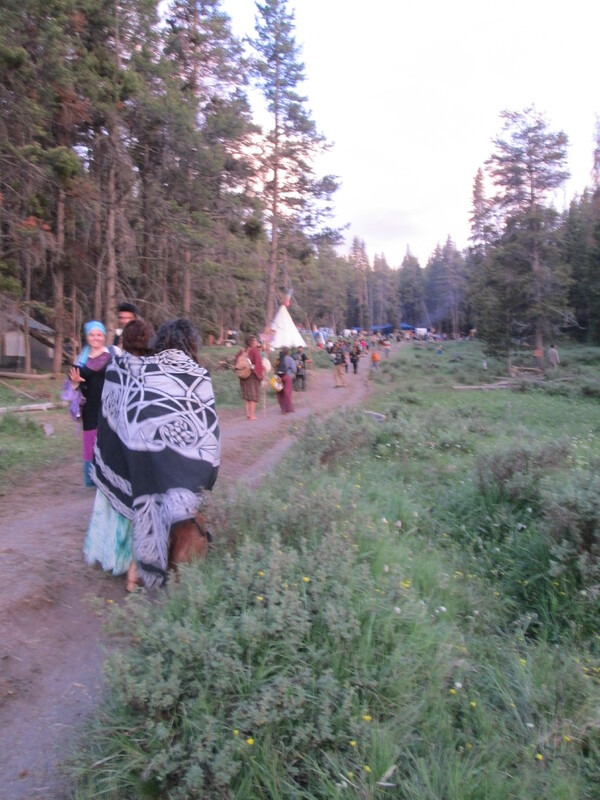 This is part 2 of 4 – to start from the beginning please go to Rainbow Gathering, Day 1. 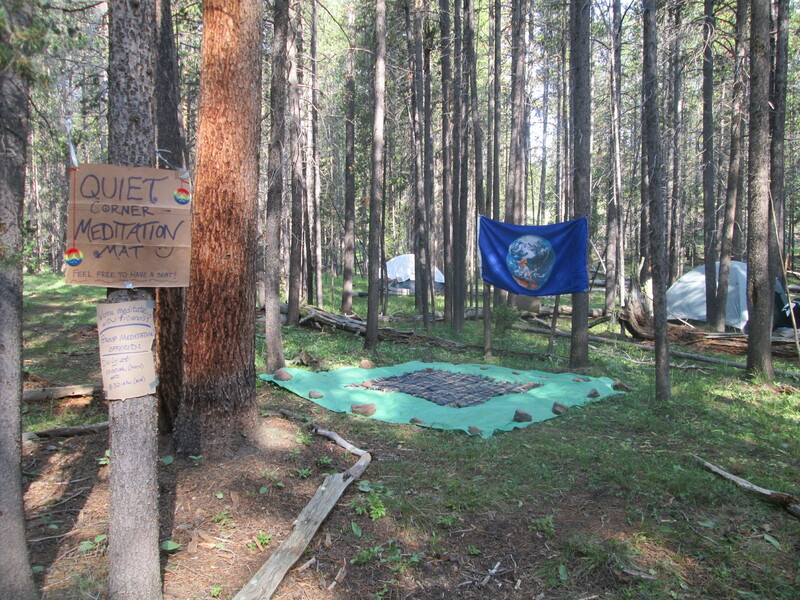 Last night was loud with the thunder of drums, horn calls, yells, shouting, belligerent cursing youth passing by on the main trail, and a variety of other noises. It was cold and seemed to go on for far too long before dawn broke and the camp was plunged into a quiet I thought may never come. And though sleep came in spurts and the noise at times was overwhelming I did not feel myself pulled into a torrent of irritation, which would’ve been the case not long ago. Instead of trying to block out the din I opened my ears to take it all in. Just as in life every drop of now is decided good or bad based on our degree of fighting or embracing. From our sleeping bags, amidst the drumming and celebrating, we also listened to a frantic search party for a 5-year old little girl named Mara on our first night in camp, who turned out not to be lost at all but asleep at a friend’s tent. We were told that close to a thousand searchers (which I would guess was an exaggeration, although there were a good many people calling her name) were looking for her. We heard the calls for her echoing through the trees, bouncing near and far, and when finally after 20-30 minutes the yell came, “She’s right here!” and the whole camp started cheering my eyes welled up with a profound sense of gratitude for the sweetness and triumph of community caring and support. I began the morning with some light guitar playing and singing softly to myself a Cowboy Junkies song which attracted a fellow by the name of Jai who was staying in upper bus village and helped to run the Roadkill Kitchen where he said they served elk, venison, and trout. He came off the trail to say hello and wound up playing me a couple of his songs which were quite good. 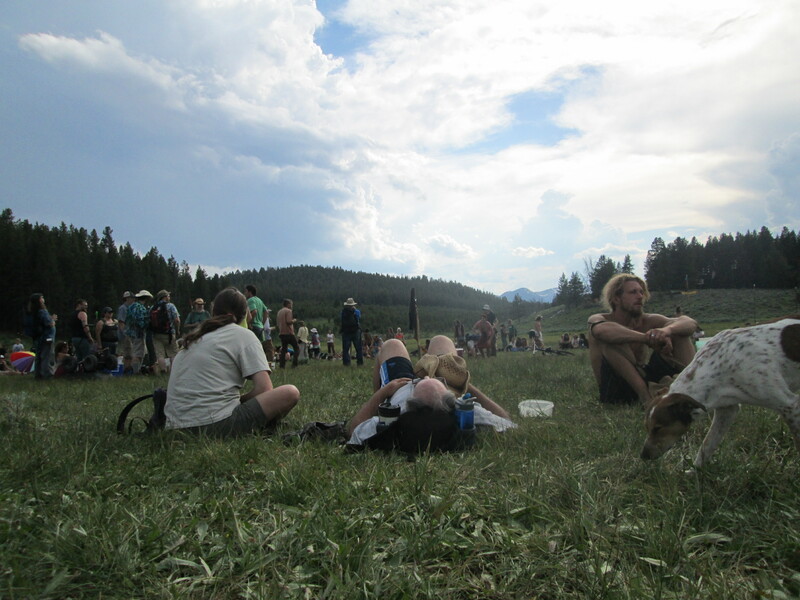 It was another bright, sunny day on the official start of the gathering, July 1st. It has been estimated that 6,000 people are present so far with more expected in the next couple of days. 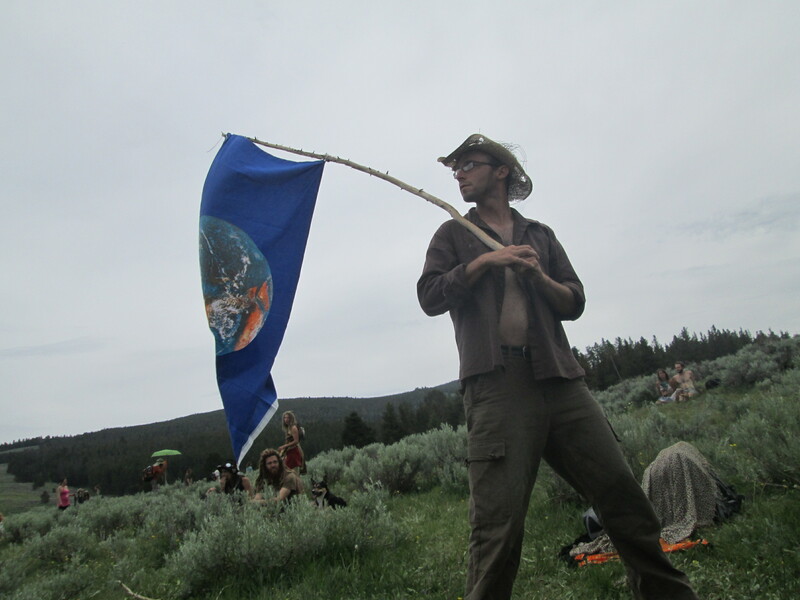 Folks from all across the nation are here, all ages, all colors, to peacefully assemble on our shared forest land. 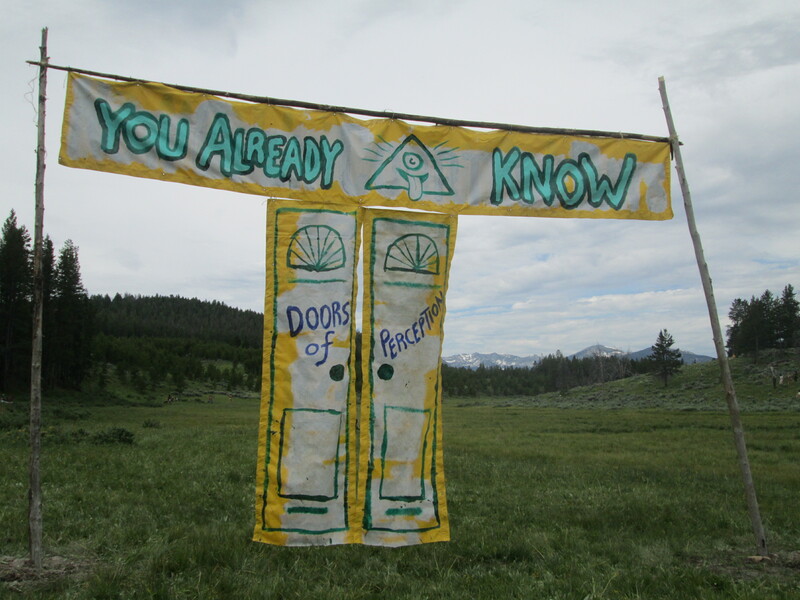 We did some exploring today and found the info booth, Kid Village, the Granola Funk stage, Montana Camp, and a host of other camps. Jaden (my step-son) and I spent time in the late afternoon relaxing in a super comfortable community teepee reading and lounging on huge pillows, mats, and blankets. 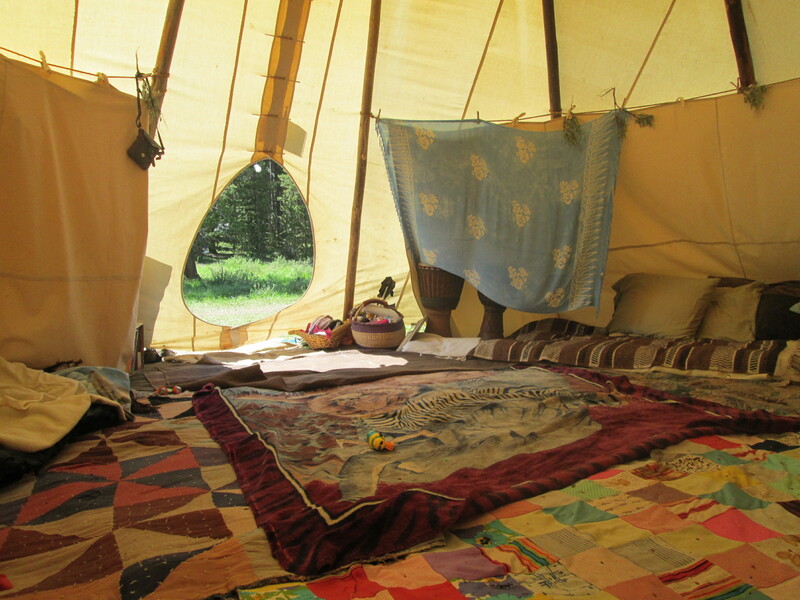 The teepee was set up in Kid Village and run by Children of the Earth, an intentional community and school in Oregon. We went through trade circle, played frisbee with a growing number of folks in the open meadow while waiting for dinner at main circle, Jaden played someone at a game of chess, I spoke with a local rancher named Clay who let Jaden and I pet his horses that he and his kids rode in on and handed us elk jerky to pass around, and I set up Quiet Corner Meditation Mat just in front of our tented homestead with a sign inviting folks to have a seat. We met friends new and old, ate well, walked and walked and walked some more. It was a good day (and the night wound up passing much quieter than the one before). 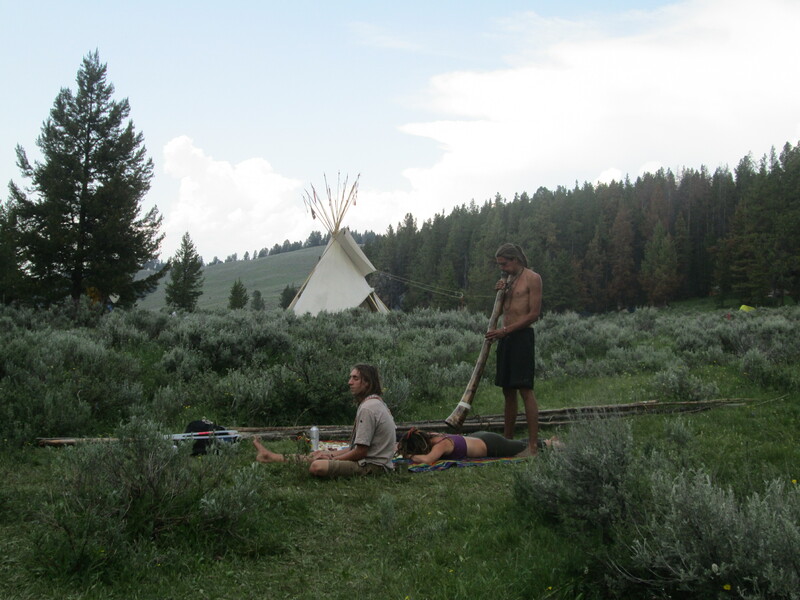 My husband, step-son, and I just returned home from the rainbow gathering in the Big Hole Valley area of south western Montana. It was my 4th gathering, my husband’s 5th, and my son’s 2nd, although our last one was 6-7 years ago. I wrote most everyday while we were gone and thought I’d share our adventure (this will be a 4 part series). 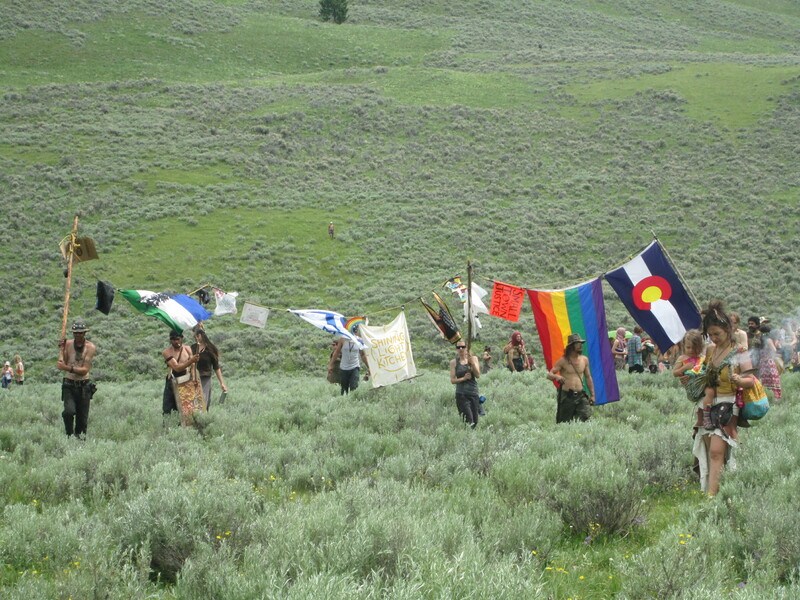 If you aren’t familiar with what the rainbow gathering is I will attempt an explanation – so, the gathering, as it is often referred to, is a national assembly of folks that happens on national forest land in a different state every year during the first week of July with the pinnacle being a circle of peace on the 4th of July. 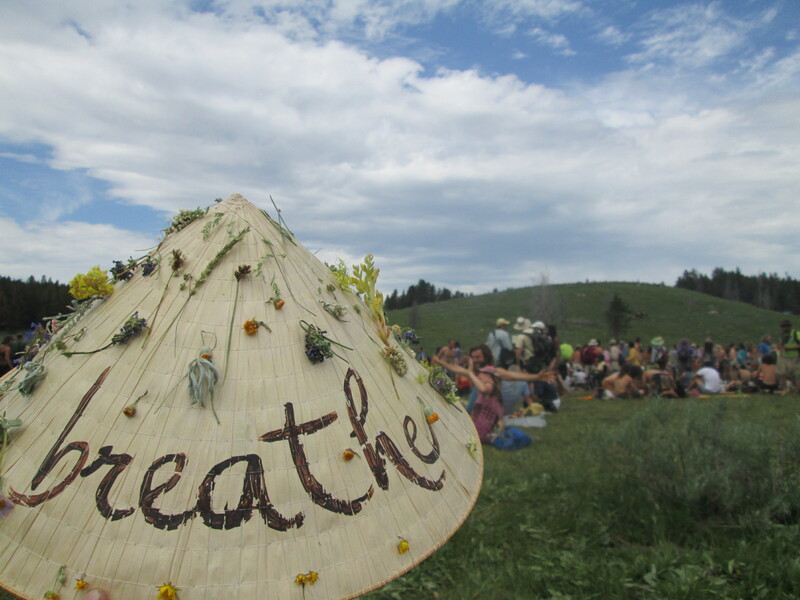 This year attracted around 9,700 people, which was dramatically lower compared to the last Montana gathering in 2000 which had 18,000 people estimated in attendance. 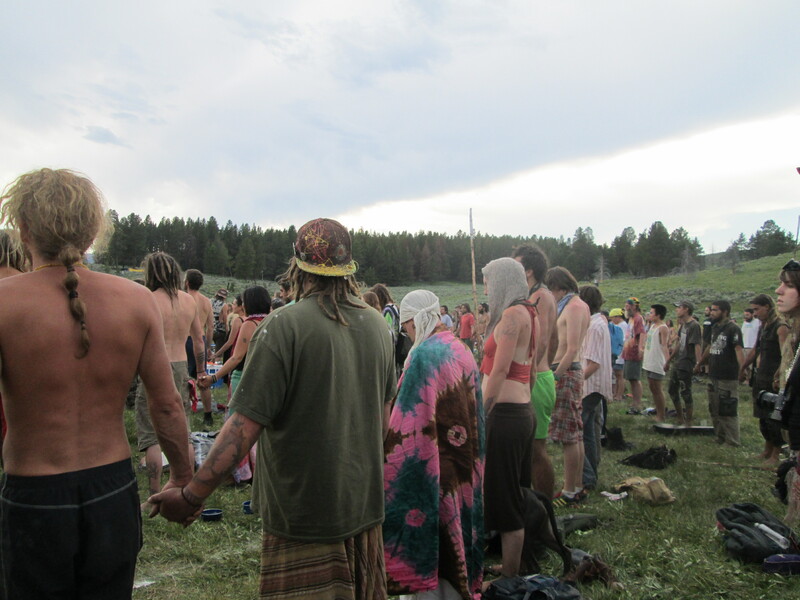 The gathering is a time to come together in community in a non-judgemental atmosphere of peace and unity. 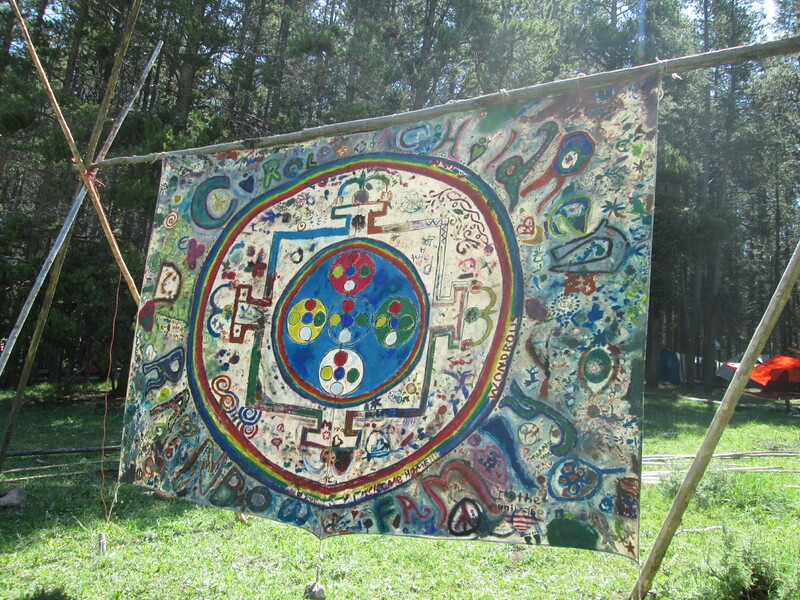 In the rainbow world everyone is family and we often address one another as brother and sister. The phrase, “Welcome home,” is used a lot as people roll into the gathering. 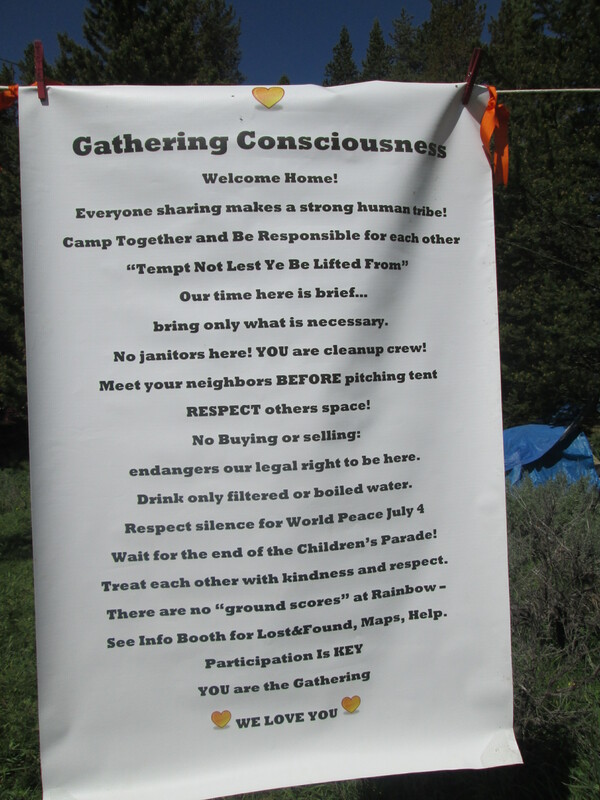 While the gathering is officially July 1-7th every year folks start arriving 2-3 weeks ahead of time to set up kitchens and camps in the woods and stick around 2-3 weeks afterwards to clean up the site. Since we are living off the land it is very important and highly stressed that we leave the site cleaner then we left it and pack everything out with us. Taking care of the earth and our surroundings is a top priority at the gatherings. Money – There is no exchange of money at the gatherings. It’s free to attend, free to eat, free to park, and free to reside there. Donations are appreciated to help keep the kitchens going but they are not required. 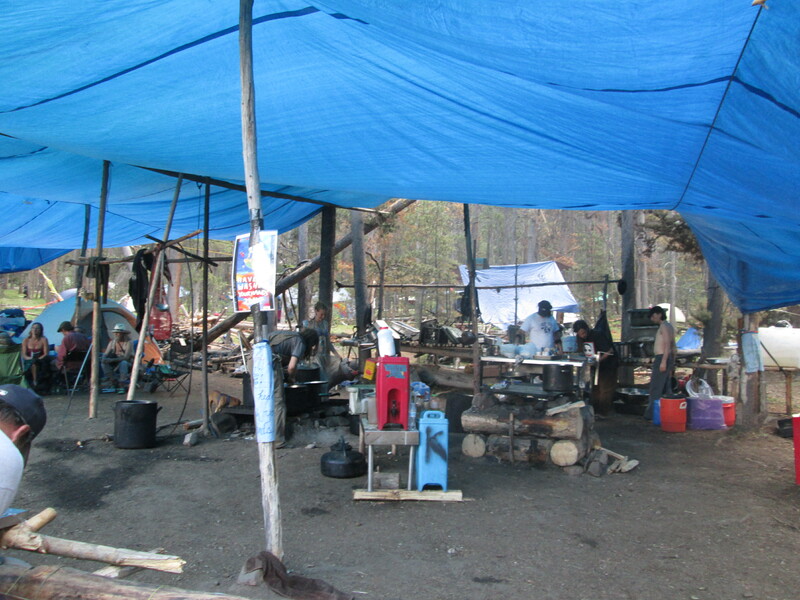 Lodging – Folks bring tents, tipis, tarps, campers, buses, and use a host of other creative materials to set up camp. 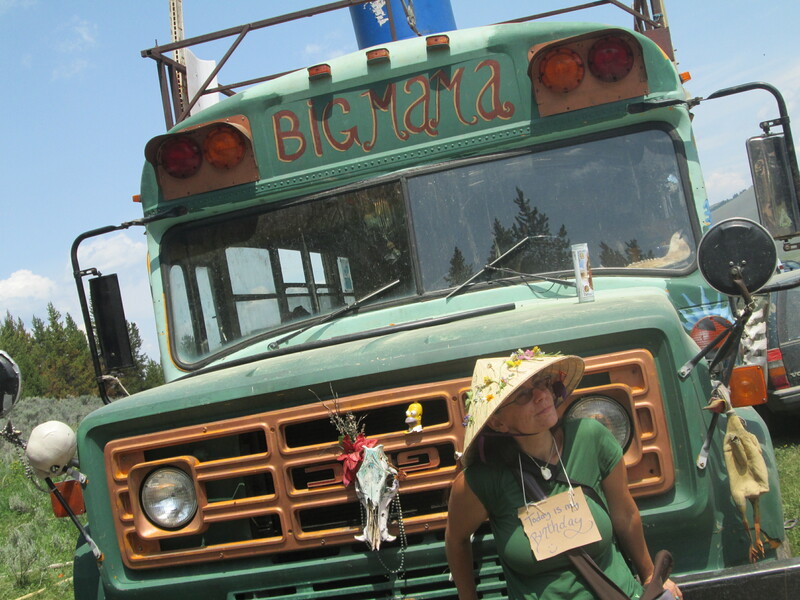 You can park in bus village and stay there or hike your gear in and set up shop at one of many set up camps or go off and make your own spot. 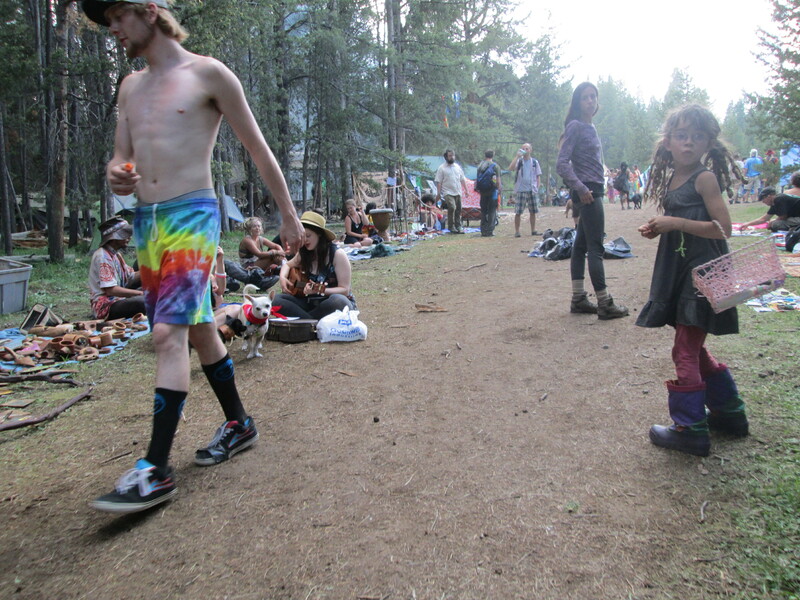 Anything goes in the rainbow world and there is everything from hammocks to camp cots to plush elaborate tipis to tree houses to canopies to a sleeping bag on the ground. It’s pretty amazing what is created in the woods and what gets packed in. Food – It’s good to bring some with you but there is plenty on hand and it’s all offered for free. Kitchens get set up that feed the masses and are equipped with a variety of services, depending on the kitchen, such as, water supply, dish washing and hand washing stations, filtered water for drinking, hand made earth ovens, stove set ups, compost and gray water pits, and pit trenches for latrines. Different kitchens serve at different times and some specialize in serving just pancakes or just coffee or chai or tea or just wild game meat and some serve big meals 2-3 times a day like Kid Village. 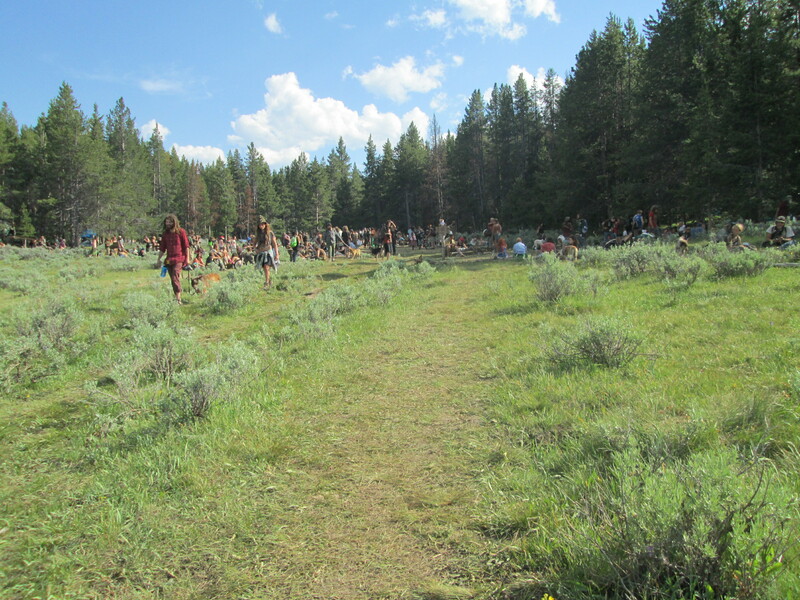 Once a day in the evening around 6:00pm you can go to main circle in the meadow (all of the sites chosen have a main meadow) for dinner. Hundreds of folks attend main circle where announcements are made, gratitudes are given, and kitchens cart in and serve food. Water – It’s also good to bring some drinking water with you and store some in the car just in case. Filtered water can sometimes be hard to come by depending on the location. Each site is chosen with access to natural water in mind so hoses are set up to run from creeks and rivers to certain kitchens and public use access spots. If drinking water is not readily available the creek or river water can either be boiled for a few minutes or ran through a filter. Latrines – The rainbow word for latrines in the woods is shitter so when you’re wondering around looking for a place to relieve yourself you’ll look for signs with the word shitter on them to know you’re heading the right way. Pit trenches are dug and usually each spot will also have a bucket of ash or lyme to cover over the waste and toilet paper. Sometimes there’s toilet paper provided but it’s better to have some on hand just in case. This is usually one of the “scariest” elements to the gatherings especially for new folks attending. Some latrines are covered with tarps for privacy but a great number of them are simply out in the open, which can make you feel like you’re on display. Trade Circle – Everyday there is a trade circle as part of the gathering where folks can set up whatever they have for trade. No money is exchanged here – it’s goods for goods. There is a wide variety of things offered here from candy (called zu zu’s in rainbow language) to rocks to batteries to jewelry to toiletry items to clothing to toys and trinkets. You can go and peruse the trade circle or go and set up your wares. As with any and all things some people really dig the trade circle while others feel it is not in the spirit of rainbow at all. At 8:00am my alarm sounded and I took to making breakfast, watering the vegetable garden, and collecting eggs from the chicken coop before setting out to become a rainbow amongst many in the woods. After some directional confusion and the important discovery that the road we were looking for was no longer marked with a sign we wove our way around green cattle fields on dry, dusty dirt roads until we came at last to Welcome Home! With packs laden with food, clothes, sleeping bags, tents, tarps, rope, books, duct tape, head lamps, bowls, toilet paper, sunscreen, a frisbee, meditation bell, and barter goods for the trade circle like Montana agate and brand new Maggie’s organic cotton socks (left over stock from the eco store I had up and running downtown for a year) we took to the main trail to find a spot to set up camp and call home for the next four nights. The day could not have tasted sweeter – shining blue skies, warm golden sun, and fresh greens were thick and fragrant. 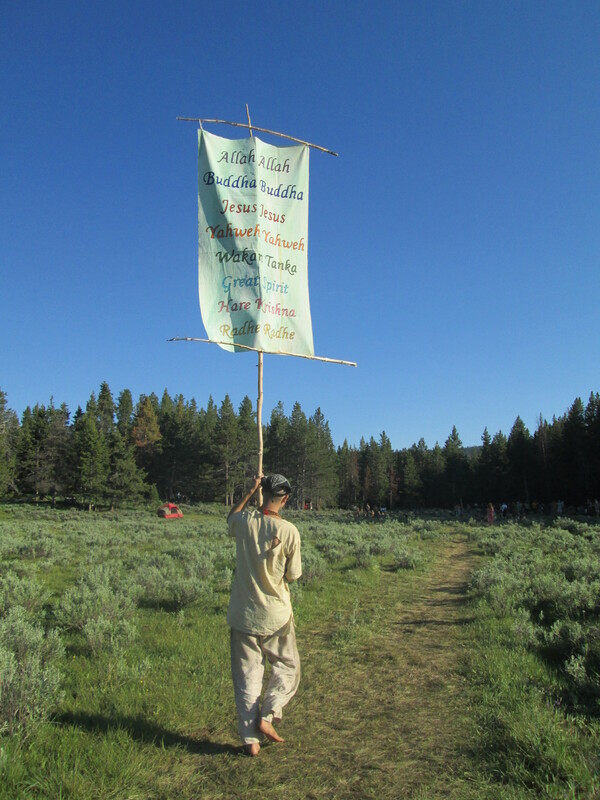 After handicamp (handicap camp), Mudder Earth and Chai Bahai (which our friends Harold and Wind run) we passed through the main meadow, trade circle, and then into the trees past Nic at Nite, and Mudd & Butts and found a place offering shade and some respite from the malay. It’s now 11:02pm and the woods are clothed in darkness. Drums, voices, barking dogs, and the occasional traveling minstrel can be heard bending through the onset of night as some, like us, attempt to sleep while still others have only just awoken to celebrate the joyous coming together of family.